Just a quick post as I've had a few people ask about this brew. It was something I'd wanted to brew for a while and finally got round to it late last year. The recipe very much has its roots in my second all grain brew, Nelson Saison, but with an adjusted hop schedule and the addition of a wild yeast strain, Brettanomyces Bruxellensis. The selection of the latter was inspired by Mikkeller's Yeast Series beer which I found really fruity with some citrus - kind of a lemony/pineappley affair with minimal funk. I assumed that series just used the brett in a straight primary fermentation. The name comes from my holiday song of last year - Royals by Lorde (a kiwi artist). You can treat your ears to it on YouTube. A beer about the yeast, but with room for hops. You can see from the schedule how delicately hopped this beer is, yet I'm sure (based on trying Nelson Saison) that those dry hops will come through loud and clear. Hope I get to try this one! (nudge nudge). Thanks for commenting David. The schedule is a bit of a shift from the Nelson Saison as I wanted the yeast to shine a bit more in the flavour rather than a hop bitterness - it's ~13 IBUs lower. The dry hop is a bit extravagant but really made a difference to the finished beer, which is surprisingly rounded. Brett just comes through on the nose but no funkiness to over power the Nelson. Will put one aside for you to try and would welcome your thoughts on it! I don't think 100 is exravagant, as I've been disappointed with certain dry hoppings. 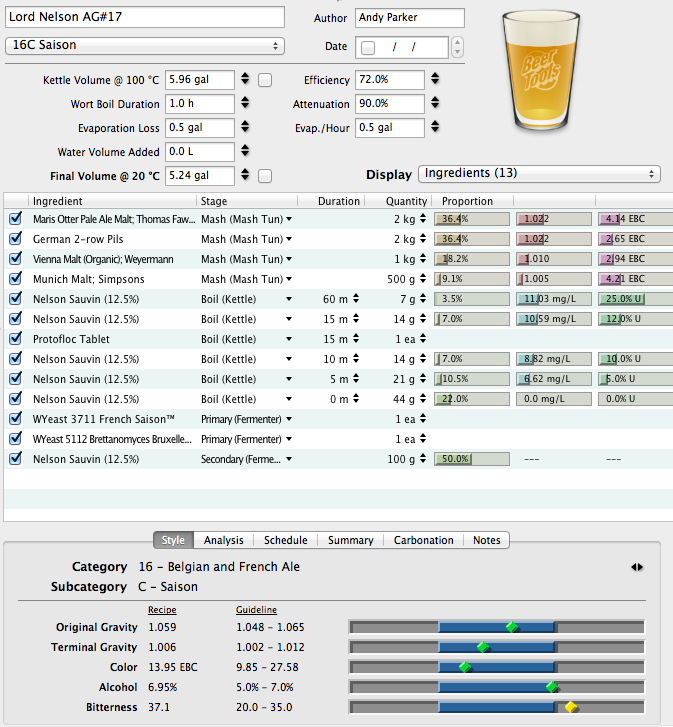 I reckon there is an upper limit for some beers, but Nelson won't run away with the beer with the lovely yeast alongside. I was being cheeky, but would love to try it. Just had a bottle of this. It was really delicious, cheers!